Yep I do have COPD – So What! Hi my name is Bill and I have COPD! Sometimes when I start a conversation with people I feel like I would if I was at an alcoholics anonymous meeting where I would have to introduce myself by first name and with the admission that I have some disease for which I don’t have total control over. That usually comes when the question comes up to me about either what I am doing, how I am doing or why am I seemingly not doing anything at all. The first year after my diagnoses it was almost easier because I was still told to be on oxygen 24/7, and when you have that skinny little tube runny over your ears and down into your nose it is obvious you have a problem. But after I was re-diagnosed 18 months later as not needing the oxygen (because oxygen levels apparently were not my main problem) and I no longer have that obvious extra facial piece stuffed into my nose to stare at – well now it feels that I have more obligations to explain why I can’t work. So I have become very adept at simply making quick explanations as to my COPD as being in late Stage III and while I do not need oxygen 24/7, I still have an enormous problem with keeping my breath for longer than maybe 10-15 minutes when doing most anything really physical. So yep, I do have COPD and while I am not always happy with it – it is the path I have been dealt and so I have to deal with it. And while I may act like it is not that big a deal, trust me – I have moments each and every day where I struggle with the frustration of not being able to work a regular job, not being able to do work in the yard and not being able to do much more than a short walk around the neighborhood or a quick 15-20 minute maximum trip on the stationary bike that sits in the corner of my bedroom. So there you go – yep I have COPD and it is in late Stage III, so what, it is what I have been dealt and all I can do is slow down the process of the lung disease by watching what I eat, what I do and who I hang with, in other words – no smokers, no ladies with fancy/heavy perfumes, no guys carrying heavy cologne on their shoulders, no dogs, no cats and no dust bunnies to name a few. By doing those important steps on a daily basis I can then have confidence that this non-curable disease can be stalled long enough so that I can still be around for each of my grandkids high school graduations which means at least another 15 years. And that folks is my story for yesterday, today and many, many days down the roads we call tomorrow. So just what is your story for yesterday, today and tomorrow? Do you have similar frustrations? Are you willing to say – hi I am ‘your name’ and I have COPD. 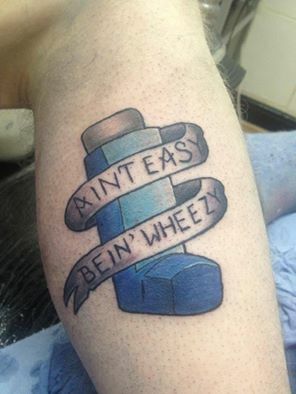 It is always good to share, by sharing we all will learn the minimum fact that ‘we are not alone walking this path of COPD’ – which is the main reason I take care of the near daily commentary and/or informational postings on what I call ‘Wheezingawy.com’ as well as the facebook page ‘COPD Travels’. Previous Previous post: HAPPY, HAPPY THANKSGIVING! Next Next post: GOOD MORNING COPD! !